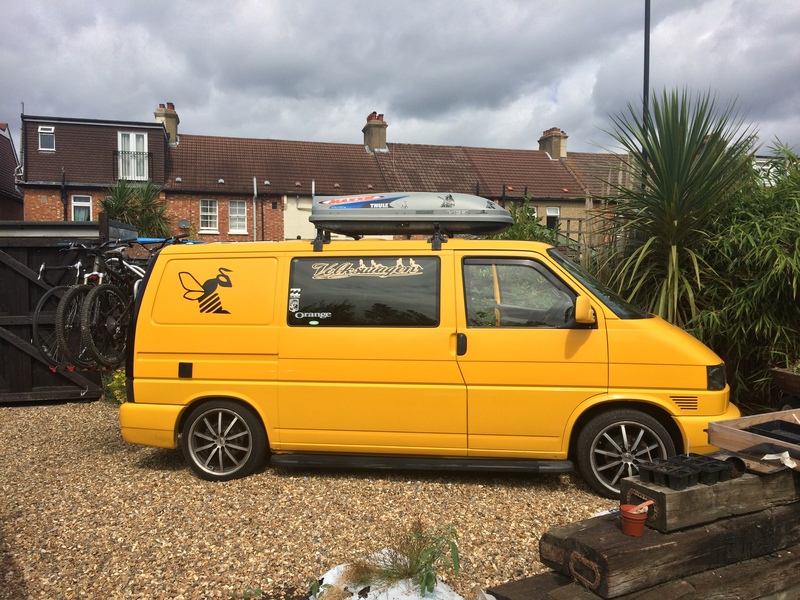 For those of you that have read through this blog you’ll know i’ve had a bit of a running battle with the fridge since we’ve owned Bumblebee, mainly getting it to keep going whilst we’re out and about without a hook up. 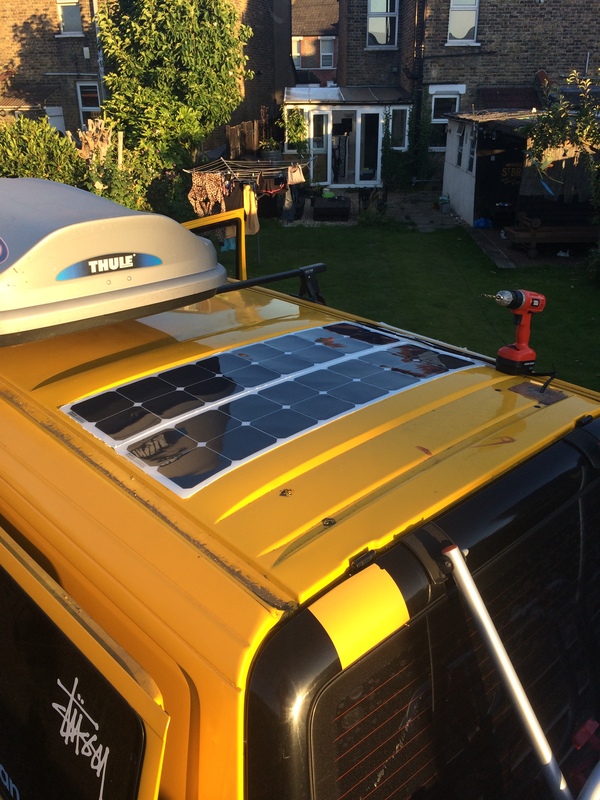 The most logical way to do this is to use solar power, I investigated a number of suppliers and eventually settled on this kit. I chose the kit above as I wanted to mount the panels between the two ribs on the roof to keep the panel as flush as possible. 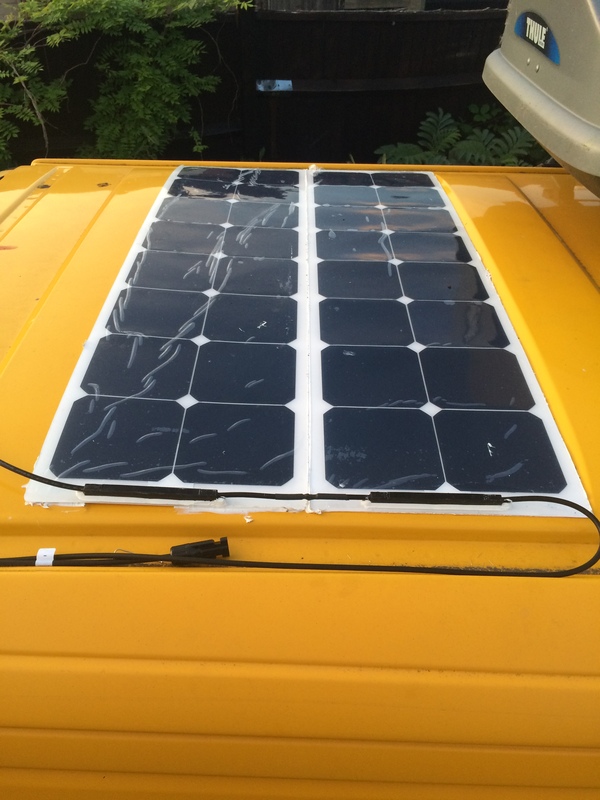 The single 100w panels are not wide enough to stretch across the two ribs and too wide to sit between them, with these 2 slim 50 watt panels I could fix one completely to the roof, then the second one mostly to the roof with only a small portion not actually bonded. First job was to get the panels bonded to the roof, you can use Sikaflex or something similar, I used Evostick Sticks Like S***, I lay the panels on the roof and marked round their position with masking tape, removed the panels and then covered the area inside the masking tape with adhesive, it’s up to you how much you use, I went all round the edges that make contact with the roof and then zig zagged between that area so plenty of adhesive makes contact with the roof and panels, next comes the fun bit, laying the panels..
With the panels in place and lots of excessive cable kicking about I left them for about ten minutes and then pulled off the masking tape, this gives a nice clean edge of adhesive around the panels, I left for a further 15 minutes and then cut off the excess cable from one positive and one negative leg and soldered them together thus wiring the panels in series, now I have 100 watts for solar power! Lastly I placed a towel over the panels and used small concrete tiles to distribute even pressure to help the panels bond to the roof, I left them overnight and resumed work the next day. As you can see from the picture above, the panel to the left doesn’t bond completely to the roof, most of it is bonded to the roof with a small part bonded to the rib, thats another reason for using the semi flexible panels, you can bend them a little. When driving the airflow over the roof will be travelling from right to left of the above picture so there is no risk of air getting under the panel and ripping it off. The following day I picked up where I left off and got down to running cables and hooking the panels up to my PMS3. The kit comes with plenty of cable to get the panels connected to the charge regulator and then some chunky cable to hook that up to your battery, the panels and both solar cables come with MC4 connectors on the end of them, they’re pretty chunky which makes getting the cables into the van a pain, also if you connect the cables on the panels to the cables supplied to connect to the regulator using the MC4 connectors then you end up with a lot of excess cable, I chopped them all off which I am sure invalidates the warranty, I soldered the the panel cables to the regulator cables, covered the joins with heat shrink and then drilled a hole in the roof, our van is an ex AA van, at some point there was a massive hole in the roof that some one has repaired using fibreglass, that is where I drilled through.. I made the hole big enough to get the cables through but also big enough so I could get some sealant in there to stop water ingress and the cables rubbing against the fibreglass, with the cables fed through I removed all of the plastic the panels have on them while transported and moved to the next job, mounting the regulator. I chose to mount the regulator just above my PMS3 as you need to have a decent amount of airflow around it to help keep the heat shrink cool according to the instructions. Next I drilled a hole between the PMS3 and charge regulator to feed the battery and panel connection cables through, I connected the panels to the regulator and then connected the battery terminals from the regulator directly to the PMS3, positive to the van terminal on the rear of the PMS3 which the leisure battery is also connected to and the negative to the common negative bar, you can wire direct to the battery if you want. To the far right in the picture above you will see 2 cables hanging down, these are labelled as “load”. You could connect your lights directly to this and the regulator has settings that allow you to turn the load on or off between a set number of hours, I just taped up the ends and pushed them through the hole and disabled any load timers on the regulator. Lastly I selected on the regulator the type of battery it is delivering a charge to, in this case option 1, a sealed lead acid battery. All wired up this is what the regulator looks like. 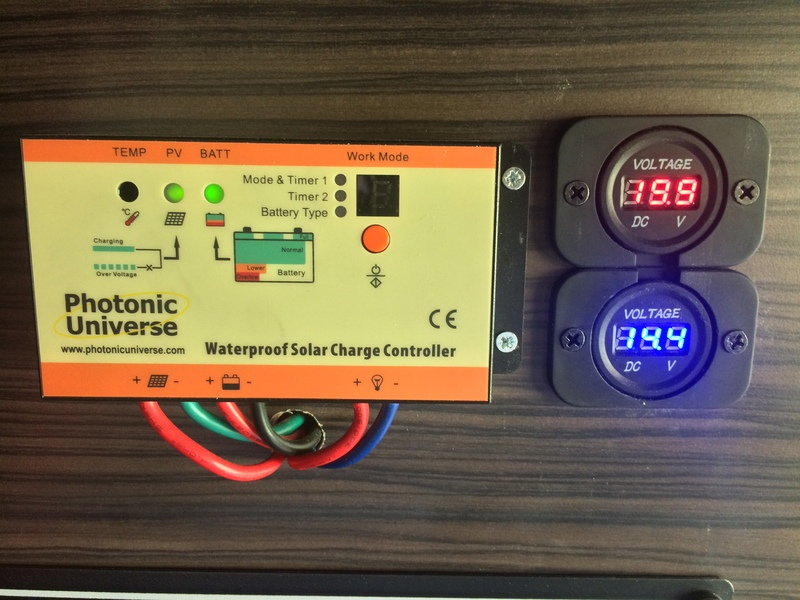 The two green indicators show that the panels are receiving sunlight for charging (left) and that the battery is within charging voltage (right). 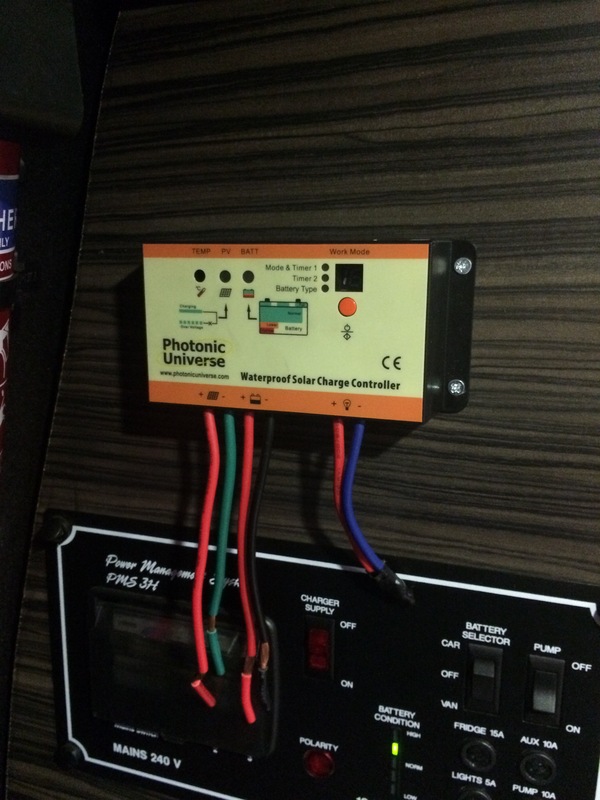 Personally, i’d like a bit more info, I’d like to know how much voltage the panels are supplying and how much voltage there is on the leisure battery, with this in mind i’ll be fitting a 12v LED display which i’ll connect to the same terminals on the PMS3 as I connected the regulator to, this will show me at all times the voltage on the battery in a digital format which in theory will include the charge voltage from the panels. The last job was to tidy up the cabling and seal any holes I made to stop water ingress. Having fitted the panel and spending 2 weeks driving around France my conclusions are as follows. Before you leave to go on your trip make sure you give your leisure battery a proper charge using a decent 7 stage charger, the solar panels are not sufficient to run your electrics and put a charge into the battery simultaneously, not moving for three days and having not hooked up drained my battery to the point where during the day the panels were providing enough power to run the fridge but not adding a sufficient charge to the battery so when the sun went down the battery would keep the fridge going for about 4 hours before there wasn’t enough in it to fire up the compressor, however, with a couple of hours drive and the battery receiving a charge from the split charger during this time, this plus what the solar panels were putting in was enough to keep the fridge going overnight, also when the fridge stopped working if you kept the door shut it was enough to keep the contents of the fridge cool until it started working again the next day including keeping the ice icy! I think a contributing factor to the fridge draining the battery is the way the fridge has been installed, there is not sufficient venting for the heat generated by the compressor on the fridge to escape, this then just heats up the area around the fridge and the compressor kicks to cool it down and so a vicious circle begins , my next step is to vent that area properly and hopefully this should increase the fridge efficiency. 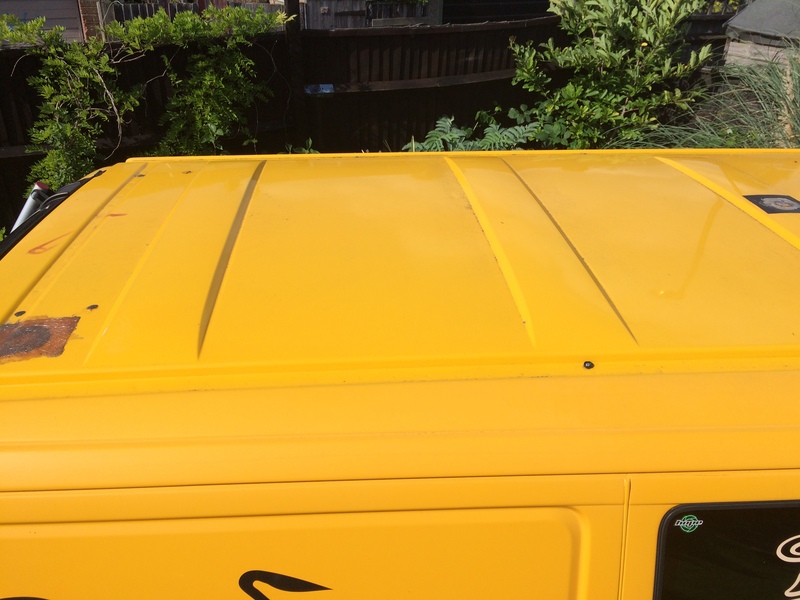 Lastly, here’s a side shot of the van with the panels fitted.. 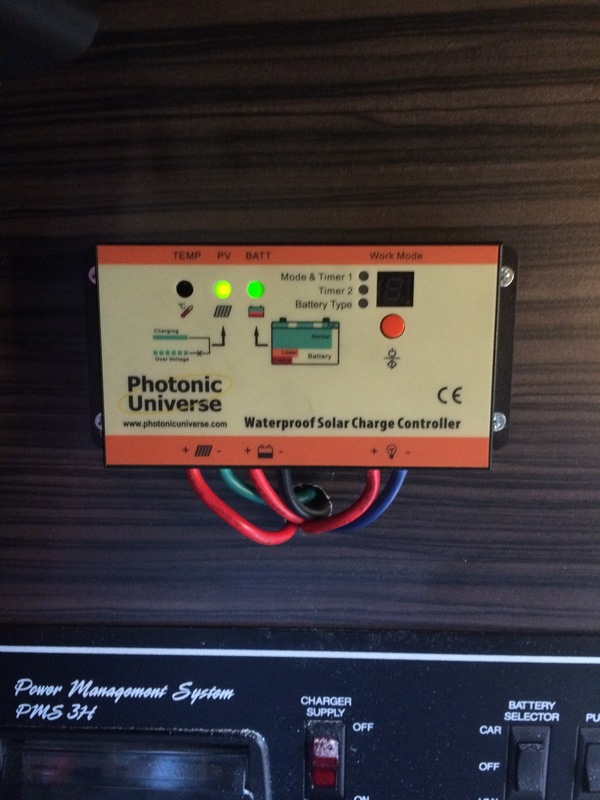 Since returning from France i’ve fitted the LED displays that give a precise indication of what is going on with the solar panels and leisure battery. The top one in red is connected directly to the solar panels and shows the voltage they are generating, 19.9v, happy with that! When the sun goes down the display turns off which means no voltage from the battery is coming back up through the regulator. The blue LED is connected directly to the leisure battery so instead of relying on a green light that says “ok” I now have a precise reading, at some point I might install a rocker switch so I can turn the display off at night. 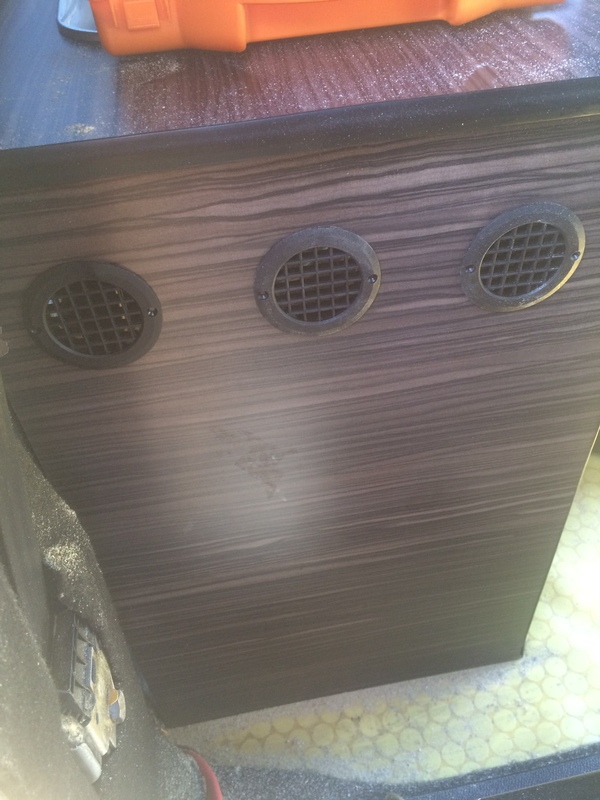 I’ve also vented the fridge, using these vents. I figured hot air rises so the heat generated by the fridge trying to see itself cool should find it’s way out of those vents at the top of the cabinet thus lowering the temperature of the void the fridge resides in, thats the theory anyway! With any luck this is the last of my skirmishes with the fridge and we’ll move forward as friends not enemies, i’m not going to hold my breath….